Researchers have developed a new way to visualize how medieval armies crossed countries to do battle. To expedite their simulations, grid computing is used to process the enormous amounts of data involved. The team from the University of Birmingham, UK, also combines archaeological and historical evidence with a computing technique called agent-based modelling to bring the past back to life. Find out why understanding medieval military logistics is relevant today. Peering into the past to understand the present is an approach particle physicists appreciate, as they currently use the grid to reconstruct particle collisions at the LHC. They recreate, reconstruct and analyze events close to the first moments of the early universe to understand what constitutes our current one. Along similar lines, researchers are using the grid to simulate humanity's past to shed light on how modern societies function. This project is called Medieval Warfare on the Grid (MWGrid). A team at the University of Birmingham, UK, is working on developing a computational grid model of how Emperor Romanos IV Diogenes moved his army of between 40,000 and 100,000 to the Battle of Manzikert in 1071. Phillip Murgatroyd, a PhD student from the team compares his task with a modern music festival like Glastonbury or Woodstock. "Now remove the music, jugglers and veggie burgers, and add thousands of horses and a few dogs. Imagine the logistical challenge of moving that mass of people and animals across the country of Turkey, in the summer, in medieval times," he explained. Why is this problem important today? Military logistics were paramount to how medieval governments organized themselves, from taxation to transportation. Murgatroyd stated: "The Battle of Manzikert was the beginning of the end for the Byzantine Empire, the last surviving part of the Roman Empire, and the beginning of Turkish settlement." There is little historical data about the events leading up to the battle - a key moment linking antiquity with modernity. Basic information such as the actual size of the Byzantine army or which route it took are mysteries. The team was led by Vincent Gaffney (Institute of Archaeology and Antiquity) and Georgios Theodoropoulos (Computer Science) - both at Birmingham. To simulate such a complex and dynamic system, they used "agent-based modeling," which captures the complex ways masses of people work by modelling the simple ways individuals (agents) interact with each other. Agent-based modelling is too complex to run on a single computer. Simulating the movement of an army with about 100,000 agents moving over 700 miles requires parallel processing. So, Murgatroyd is creating a model and working with researchers to incorporate it on a distributed computing cluster called BLUEBear, using the agent-based software framework PDESMAS. This dotted-map visualizes the movement of 91 Byzantine agents across Anatolia. The front of the line finishes the march before the rear starts. Murgatroyd suspects this was a typical situation in medieval campaigns. His hope is to create more complex and clearer animations. Image courtesy Philip Murgatroyd. To avoid inputting erroneous data into the model, Murgatroyd approaches this task with the idea that: "All models are wrong, but some are useful." For example, researchers cannot know for sure the body size and fitness levels of every individual in the Byzantine army, which in turn influences calculations of how much energy each agent needs to move and how much food is needed. But modern data can still be used. The physical features of Turkey (Anatolia) are largely unchanged from medieval times and used to model the terrain of the landscape. All this data allows a 'what-if' scenario to be made. Different hypotheses of plausible situations are then compared with historical evidence. If the army could not feed itself well enough to get to the battle, then it supports evidence that 100,000 is an unrealistic size for an army. Combining evidence from the agent-based model with archaeological and historical evidence gives researchers a more complete picture of actual events and insight into the thinking of the medieval state as a whole. 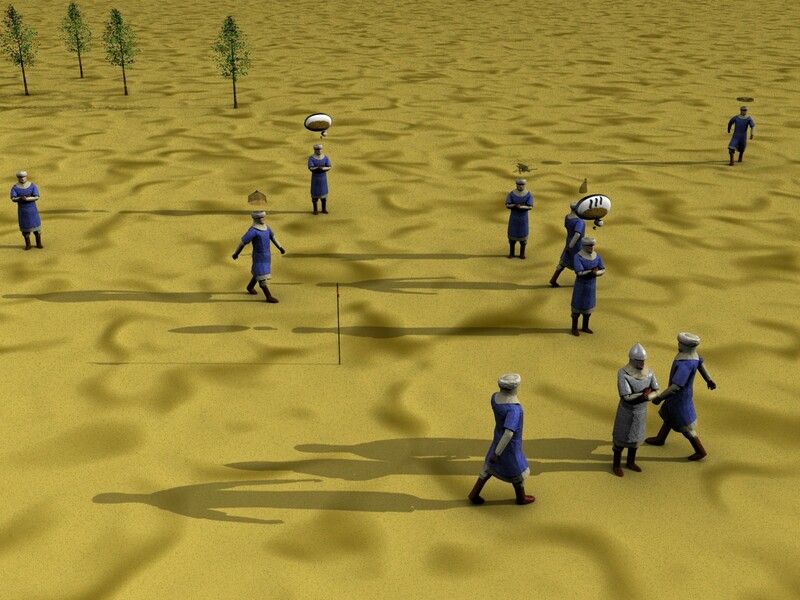 The MWGrid team do not simulate the entirety of actual battles because modelling individual decision-making during combat is very complex and does not give researchers information about logistics of moving the army. Instead, by examining an army's decisions to move from point A to point B, researchers stand a good chance of determining why a given army won a battle. The MWGrid team brings to the foreground the sometimes neglected, but insightful, evidence about the sociological challenges facing a sophisticated human culture a thousand years ago. Murgatroyd said: "Agent-based modelling for historical military logistics is unprecedented, so we're breaking new ground." The team have already published academic papers. Soon, they aim to create animations illustrating their model. These will all be freely available once the project is finished this November. For the MWGrid website click here. The MWGrid introductory video is located through this link.